There are certain foods in which you can’t just stop at one piece. You try. You really do, but they are just that good! 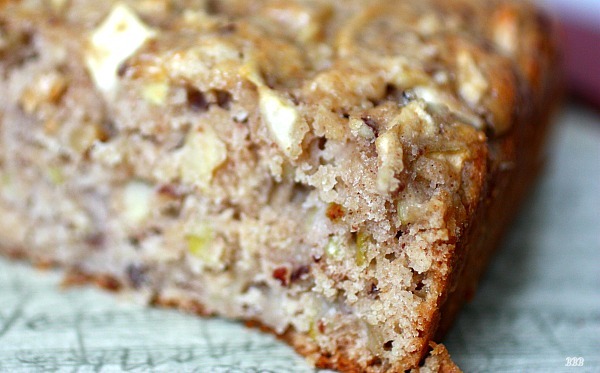 This is one of those “Best intentions” kind of quick bread recipes. 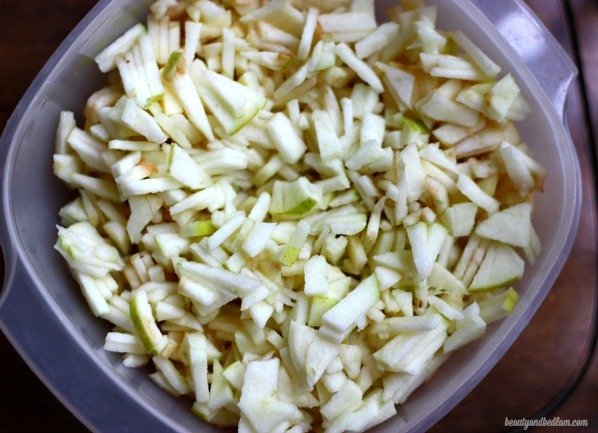 As you finely chop the apples, assure yourself that quadrupling the recipe will not lead to your downfall. As you peel and chop, tell yourself that leaving a little of the peel on the apples is much healthier for everyone. It’s quite true and they never know anyhow, so don’t confess your lazy chopping tendencies. Pour the glaze on while the bread is still piping hot because, while any good cook should first let it cool, there’s isn’t a chance that it’s making it that long with your family around. It may fall apart if you don’t wait for it to cool, but it’s worth it. 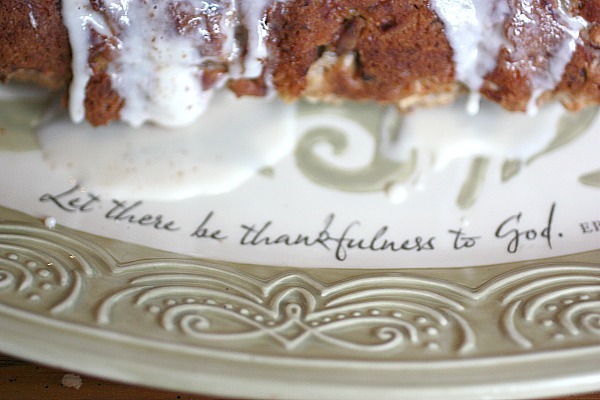 Pause and give thanks (and maybe take a picture) because shouldn’t everyone give thanks when they have delicious Apple Bread with hot glaze dripping down the sides? Yep, that’s what everyone should do. *** FYI: The dough does not come together like a moist batter. I’ve done some variations with this recipe. I’ve used less sugar when adding additional fruit. I’ve also used whole wheat flour instead of white. The nuts and raisins are both optional, but they are delicious additions. This freezes well, so double the recipe and save one for later. As is, the bread is not overly sweet, but the glaze gives it the dessert touch. 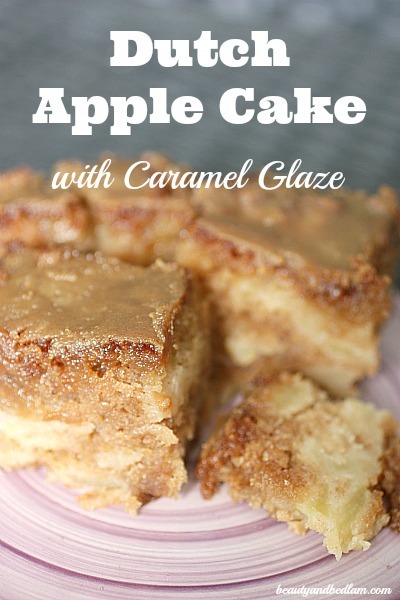 If you are looking for a very rich and amazing apple recipe, give my Dutch Apple Cake a try. With seven apples, it’s simply the best apple cake you will make. Summary: Packed with fruit goodness, this delicious Glazed Apple Bread is one of our favorite quick bread recipes. Combine oil, sugar and vanilla. Sift together cinnamon, salt, flour and baking powder. 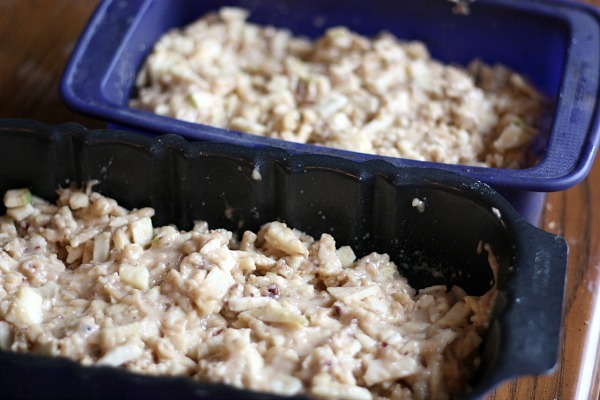 To the dry mixture, add the milk, raisins, apples and nuts. Gently stir until just moistened. Bake in greased loaf pan for 50-60 minutes. This is best if made day prior to serving, but I would never know because it doesn’t last. This looks and smells (in my head) wonderful. Can’t wait to try it. Thanks for sharing. There is no such thing as a tiny piece. Well, there is, but that means that you should have several tiny pieces. Applier is a word in my book, and I love that plate! I actually don’t let my baked goods cool before adding the glaze because I like the way the bread soaks it up when it is warm rather than letting it set on top. My favorite recipes are the ones that can be frozen and still taste almost as good as the day they were baked. Thanks for the great recipe. Looks amazing! I love anything with lots of texture, and I can see this would fit the bill for me! 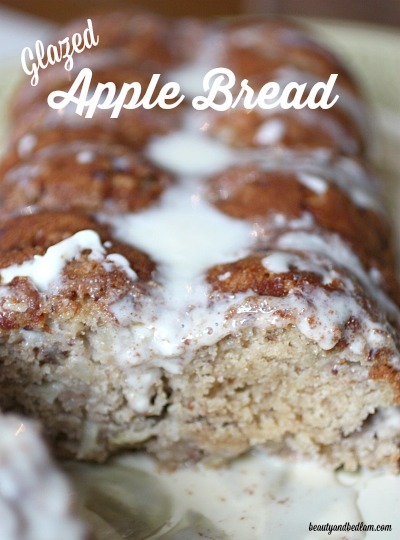 I was so excited to try your yummy apple bread recipe! When I was mixing the wet and dry ingredients together the dough was so dry that it was difficult to incorporate all of the flour into the dough. I checked and double checked my ingredients thinking that I must have made an error, however, I followed your recipe exactly. Any suggestions, or could an ingredient have been inadvertently left off of your post? Thanks so much, love your awesome blog! Hmm, so sorry that happened. 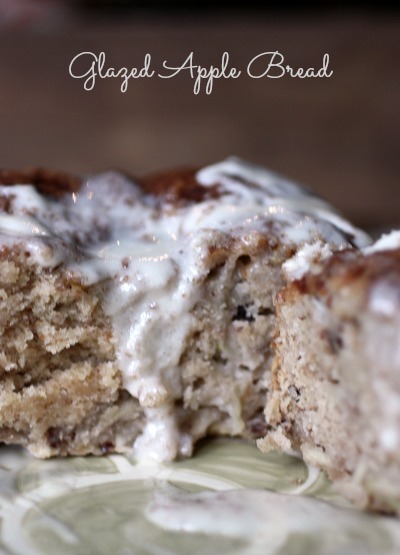 It doesn’t end up being a moist batter, but did you mix it together anyhow and bake it, as is? Did it come out ok or did you add more wet ingredients? That’s how I make it, but I will whip some up again and double check my notes. Just wanted to see how yours ended up if you went with the stiff batter. Apple season is here in full swing and this is exactly what I was looking for. Something else to do with all these apples. I used a mandolin slicer with that jullienne piece to do you a triple batch super quick. Only to realize my bread pans were mia. I found a big bread pan a regular one and then I put the other batch into a cake pan. An 8″ round. Now I keep calling it cake instead of bread. Ha! Thanks for the great recipe. My kids are in heaven.